The Holy City of Jerusalem is perhaps the most significant, and almost certainly the best-known religious city on Earth. In no other single place can you find such a concentration of sites sacred to not just one, but three major world religions: Christianity, Judaism, and Islam. 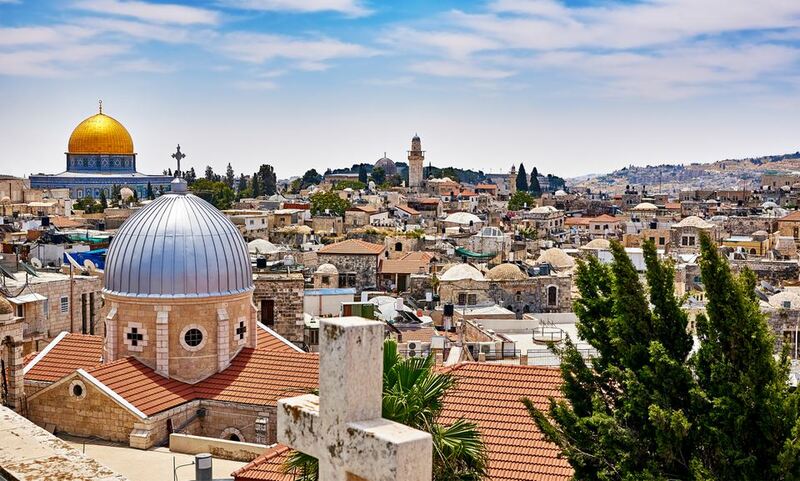 This compact ancient city, surrounded by a wall more than 450 years ago, and home to one that is among the holiest of Jewish sites, never fails to amaze visitors with the extraordinary religious history contained​​—and very much alive—within. By tradition this, the holiest place for Catholic and Orthodox Christians​ marks the site of Jesus’ crucifixion, burial, and Resurrection. It was completed in A.D. 335, its basilica having been constructed on the foundations of an ancient Roman temple to Venus (Aphrodite). The actual sepulcher is inside the ​​Edicule, a two-room chapel underneath the church’s rotunda. There are separate prayer times for the various denominations. Keep in mind: Expect long lines to gain entrance to the Edicule. The Temple Mount is a large, ancient elevated platform in the Old City of Jerusalem with a multifaceted (and sometimes contentious) religious significance. Historically, it took its shape from the construction of the First and Second Jewish Temples. At its center today is the Dome of the Rock, an ornate Islamic shrine built in 691 and Islam’s third holiest site as it marks the spot of Abraham’s offering of Ishmael and the Prophet Mohammed heavenward ascent. It also covers the Foundation Stone, itself considered the holiest site in Judaism. The Dome of the Rock is adjacent to the Al-Aqsa Mosque, also part of the Temple Mount. Keep in mind: ​The Temple Mount is not only beautiful, but it can also be a place of high tension as it has been a flashpoint in the Israeli-Palestinian conflict. The Western Wall, also known as the Wailing Wall, is one of Judaism's most holy sites and forms part of the western flank of the holy site of the Temple Mount. The wall is the imposing remnant of Jerusalem's Second Temple, which the Romans destroyed in A.D. 70. According to Jewish tradition, despite the temple's destruction, the divine presence never left. While the wall itself stands as an impressive archaeological record from the time of King Herod, the hush that envelops the plaza in front of it as Jews approach the base of the wall to pray is also captivating. Jews come from all over the world to place prayer notes in the wall's crevices. Keep in mind: The Western Wall is a holy site and visitors are expected to don a kippah (small Jewish skullcap) before approaching the wall (kippas are available free of charge at the site). Also, there is a separate area of the wall for female visitors. Jerusalem’s Zion Gate connects the Old City to Mount Zion, just west of the Mount of Olives, and a place that holds sites sacred to Christians and Jews. The Tomb of King David is located here, as is the Room of the Last Supper, which is a Romanesque Crusader structure also called the Coenaculum. Also on Mount Zion is Dormition Abbey, which by Catholic tradition is where the Virgin Mary fell into an eternal sleep (Assumption of Mary). Keep in mind: When visiting King David’s Tomb, you’ll be asked to switch off your cellphones. And if despite the warning you keep yours on, chances are good you will lose the signal as you approach the tomb. The Via Dolorosa is the road Jesus walked from the place of Pontius Pilate’s sentencing to Golgotha (the location of the crucifixion) and is the most sacred Christian byway in the world. Of the 14 stations, which Christians have been walking for more than a thousand years, the most famous is the Praetorium, where Jesus took up the cross and the Church of the Holy Sepulchre. Those walking the Via Dolorosa—which means “way of sorrows”—symbolically relive the moments of Christ’s Passion. Keep in mind: If you’re walking the Via Dolorosa anytime between April and October, you can expect it to be hot, so be sure to wear a hat to protect you from the sun, and keep hydrated. The Mount of Olives, so named for the olive trees that once grew in abundance there, rises some 2,683 feet above East Jerusalem. Perhaps most widely known as the site of a Jewish cemetery in use for more than 3,000 years, it's home to sites of significance to Christianity and Islam as well. Mary's Tomb, the Church of Maria Magdalene, the Tomb of Zechariah, and the Garden of Gethsemane are all located here.